MECANOGRAPH reflects the synergy between a manufacture-made chronometer-certified movement and the incomparable design qualities of Louis Moinet. The balance with screws, the lever and the gear trains are highlighted in an original way that is different on each side of the watch. 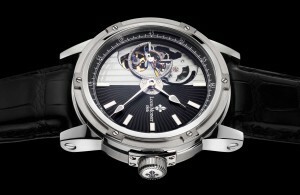 MECANOGRAPH innovates in terms of the technology of self-winding watches, by updating an historical operating system. Within this distinctive and rare mechanism, small and large pawls work together with the automatic winding gear train. In addition to its spectacularly attractive appearance, it offers the advantages of a bidirectional winding system. 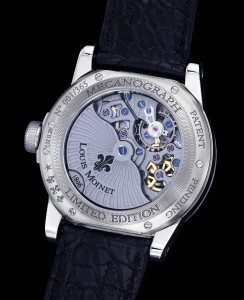 Calibre LM31 was entirely conceived and crafted by Louis Moinet and Concepto. It is composed of 182 different elements and displays chronometer-worthy precision, as is confirmed by its COSC certificate. Nonetheless, its most remarkable characteristic is the way in which it reveals the entire regulating organ, as well as the escapement and its gear train, highlighted by the anthracite coating on the mainplate and bridges. One of the main challenges was to insert the seconds hand within this magnificent mechanical ensemble. This has been done by means of a distinctively shaped applique and a double read-off hand, thereby affording a new vision of time. Viewed from the back, the balance with screws shows a different and original face compared with the front view. It is fitted within a set of anthracite-coloured bridges adorned with “Côtes du Jura”® and enhanced with 26 jewels made using the Verneuil process and presented through openings, as well as by blued steel screws. To achieve its chronometer-level precision, the manufacture-made movement LM31 vibrates 8 times a second, meaning 28,800 vibrations per hour. 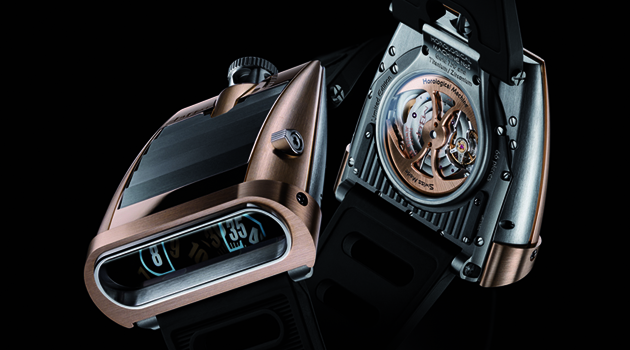 It is endowed with a 48-hour power reserve and the rotor is mounted on a high-tech ceramic ball bearing mechanism. 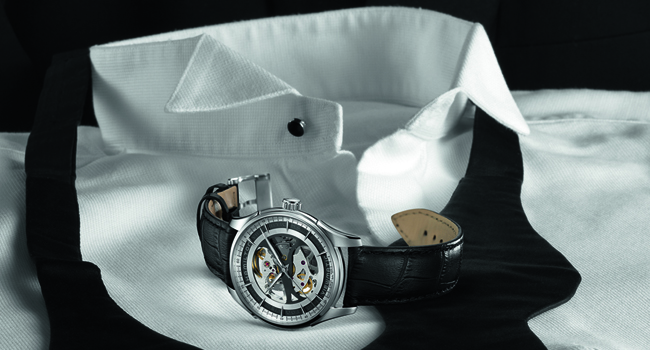 This exceptional movement asserts its originality through the strong character of its exterior. The external minute track as well as a half-dial adorned with the emblematic “Côtes du Jura”® motif contribute to forging the elegant spirit of this watch with its strong personality. The time is read off on hands designed by Louis Moinet and nicknamed “Gouttes de Rosée”® (for their dewdrop design). The case is made from grade 5 titanium with polished and satin-brushed finishing. Two versions combine 18-carat rose gold and titanium. 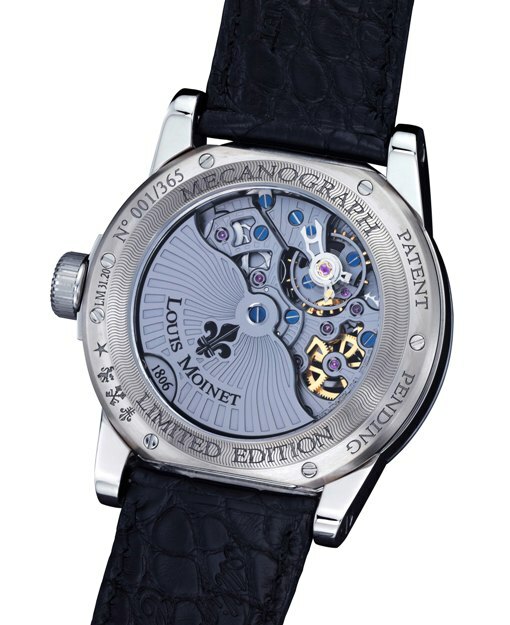 The design echoes the Louis Moinet signature codes, meaning an upper six-screw bezel and its unique interchangeable crown tube system for which an invention patent has been filed. MECANOGRAPH is a unique creation issued in various 365-piece limited editions destined to be worn by devotees of creative horology.